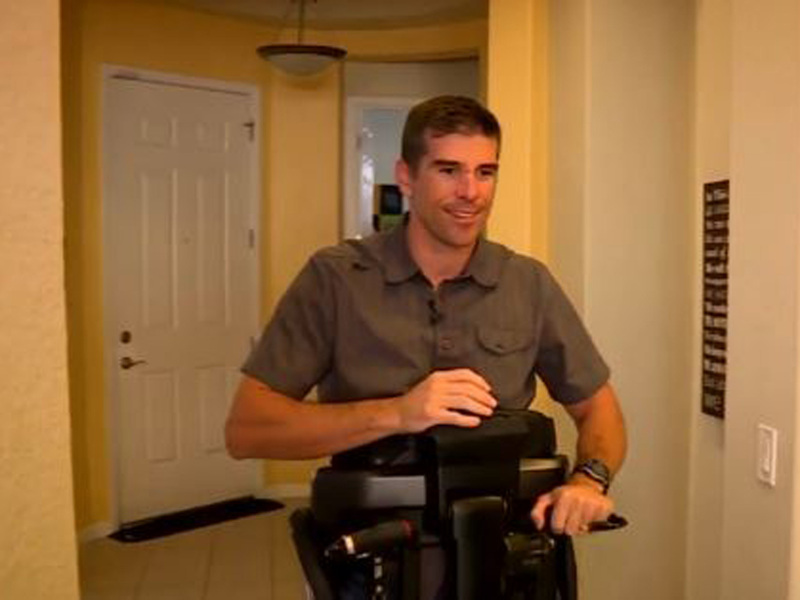 MIAMI - The next generation of wheelchairs is helping people stand whenever they want thanks to the use of robotics, reports CBS Miami. The Tek Robot Mobilization Device is a Segway-like machine that allows people with spinal cord injuries to stand and move while upright. During a bike race last year, Bill Winchester struck an illegally-parked trailer, leaving him paralyzed from the chest down. The Tek RMD device gives Winchester a renewed sense of freedom and confidence. "That self-confidence, that ability to be recognized as an adult standing, the mental element of looking eye-to-eye to somebody is a tremendous mental and moral accomplishment," Winchester said. Winchester has been able to stand in physical therapy, but the 200-pound mobility robot allows him to navigate through his house with greater ease than with a traditional wheelchair. According to the National Spinal Cord Injury statistical center, 270,000 Americans live with a spinal cord injury. According to Dan Niccum, CEO of Innovations Health Services, a company that sells the Tek RMD, demand for the product has been so high it's nearly sold out through the first quarter of 2016. "It takes someone in a wheelchair who can access 45 percent of their home - they can't cook, they can't iron, they can't vacuum - and it puts them in a situation where they can access 90 percent of their home," Niccum said. Sonny Ali was injured during an anniversary trip to Tahoe with his wife and twin boys. "It's more emotional than it is physical," Ali said. "My accident was last December and I'm used to being down there. That's my new life, my new norm. For me to occasionally stand up and be at eye level with other people -- it's big." Though life-changing, the device also comes with a pretty price tag, with a single unit costing around $20,000. The device is not covered by insurance yet, but could be in the next two to three years.